​It was on October 15, 2015 when I published my third eBook “The Foodie Guide To Farming Insects For Protein.” In the three years it has been available online, it has outsold all of my other eBooks combined. I currently have six titles published. In fact this month alone I sold more copies of it than any other month this year, other than March. I sold twice as many copies in October as I did in September. So, what makes this such a popular eBook for me? I’m just going to take a few guesses here. I have to admit that when I wrote the eBook I had never heard of such a thing as eating insects or raising insects as a food source. I knew that live crickets were a food source for various reptiles and that you could order them from your local pet store. I also knew edible insects were a common dietary feature in some foreign countries but did not know the popularity of this was moving into North America. So I credit the timing as helping with sales. Plus, when I published it, it was the only eBook on the topic available at Amazon. This is no longer the case. Still a little bit related to timing, I had no idea there was such a thing as World Edible Insect Day. It happens to be October 23 each and every day. I published my ‘edible insect’ eBook on October 15. I used World Edible Insect Day as a launching pad – totally as a fluke as I only learned about it once I had published the eBook. So I used Twitter to promote free downloads of the eBook for a few days either side of World Edible Insect Day. It worked as I had a massive amount of copies downloaded during that short promotion. Well, obviously there has to be something worthy buried somewhere within the topic of edible insects. The research I did on it convinced me that there is promise in delivering high protein food through simpler means. If that translates to massive cricket farms filling up the countryside, okay. Mind you, I am still fond of a burger every so often so I don’t see my diet changing all that much. However, if we are talking about cricket flour, now you have my attention. This is currently my preferred way to enjoy edible insects. If this has piqued your interest any on insect protein, all you have to do is download a copy of my eBook to gets the details. In it I tell you about the nutritional value of the most popular of the edible insects. I also describe how you can start farming crickets in the space of a small closet. Plus, there are a few recipes included to get you started. I knew I was on to something when I started working on the eBook. Now I am convinced that I have discovered a way to keep protein in my diet and do so within a much smaller carbon footprint. ​Sure, for many, the mere thought of chomping down on an insect the size of a cricket can give the old blood pressure a tweak. However, what you are truly missing out on is that the manner in which these edible insects can affect your blood pressure is actually in a positive way. That’s correct. Eating crickets can help to lower your blood pressure. Here’s how they do it. Crickets happen to be high in protein and potassium. In fact, in some cases, crickets outweigh pork tenderloin in the protein department and almost match bananas in potassium. Because crickets measure so high in potassium, you could have a magic heart saving secret weapon hopping around in your garden. That’s because studies have shown that individuals with hypertension recorded lower blood pressure levels after consuming potassium. Potassium has some additional benefits for humans including the ability to reduce stomach bloating. Bloating – in case you didn’t know – is caused usually by the sodium that is contained in salty-tasting foods. And who doesn’t like salty foods? We know. It’s a tough one to get around but with potassium as the solution to the problem, you almost have a good reason to have another bag of potato chips or whatever else you crave that is heavy on sodium. Assuming your next move is to start adding edible insects to your diet – even if just to scoop a few of the cardio benefits – there are a number of ways to snack on crickets. Probably the easiest way is to roast them. Your best bet is to quickly freeze live crickets then once your oven reaches the right temperature, take the frozen crickets and spread them around on a platter. Season with your favourite seasonings and roast until they are crisp and crunchy. If the idea of freezing live crickets isn’t your thing – and you freeze them before roasting in order to keep them fresh – you can always opt for cricket flour. This is a mixture of ground up crickets that is added to regular white flour which in turn makes the flour protein and potassium rich. Cricket flour is then used in various baking recipes as you would use regular flour. The only difference is that those biscuits or loaves of bread are now higher in two nutrients. Two other alternatives that utilize cricket flour are cricket protein bars and cricket pasta. These two happen to be my favourite ways to enjoy crickets. The benefits to eating cricket protein bars are many and they are available in a number of different flavours for your enjoyment. As for cricket pasta, many different meals can be prepared with this as you would with regular pasta. Hot or cold, cricket pasta packs a punch with high protein and potassium levels. Need More Information On Edible Insects? 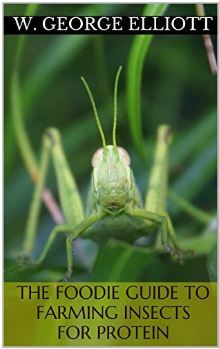 I have published an eBook on edible insects. For more information, click here. ​I know I have written about bugs and the nutritional value that insects contain for some time now. I’ve even indicated that a large percentage of the world’s population dine on edible insects. However, I’ve never really indicated what some of those countries are other than to point out that insect protein is in many cases a vital part of many different cultures. So this time around my goal is to focus on the top bug eating countries in the world. Entomophagy is nothing new to the people of Thailand. In fact, many snack on fried bugs and chase them down with a frosty cold beer. Outdoor markets in the larger cities feature vendors selling fried edible insects and one very popular national treat is a deep-fried cricket covered in a soy sauce-like seasoning with pepper. Other insects that are commonly eaten in Thailand include grasshoppers and wood worms. Termites happen to be viewed differently by Ghanaians than they are by most of the rest of us. While many find them pests, the people of Ghana usually dine on them along with other insects as a normal part of their daily diet. Termites are actually high in proteins, oils and fats and are typically fried, roasted or ground into flour for baking. Bugs fill the meal plans when food is in short supply during the spring. If you think I’m heading towards talking about worms in bottles of tequila, you would be wrong. Bugs have been on the Mexican food radar for centuries and have become somewhat of a delicacy in many cases. Choices range from French-fried caterpillars and ant eggs smothered in hot butter to candy-covered worms and chocolate-covered locusts. And, yes, there’s also that bottle of mescal with a moth larvae inside of it to drink. Insects in their larval state are often served in the fanciest of dining establishments in China. The Chinese are also known to snack on boiled water bugs soaked in vinegar and live scorpions swimming in liquor. Roasted bee larvae and fried silkworm larvae are top choices simply because they register high in iron, copper, zinc, thiamin and riboflavin. When the people of China start to feel the winter chill, they warm with a bowl of ant soup. Queen ants are the national edible insect of choice in Brazil. In fact, celebrations revolve around the massive winged ants that pop out from underground late each year. They are collected where their wings are removed and the ants are either fried or dipped in chocolate as snacks for Brazilians. The ants are so popular that they are celebrated in many different ways throughout the country. Apparently, they taste like mint. If it wasn’t for the high concentration of protein found in edible insects, they probably wouldn’t be eaten in Australia. The Aborigines are the primary diners on bugs down under and are fond of cooked moths. Honey-pot ants and wood-eating moth larvae are also favorites. When roasted the insects taste a little like almond although the practice has not really gained a foothold in the urban centres that house large populations of Aussies. Japan and The Netherlands are the last two countries to make our list. Bugs have been a common dietary item in Japanese culture for centuries and are still featured items in many a restaurant. The Netherlands is fairly new to the concept of eating bugs. Insect breeding is commonplace in this country and the popularity of eating them is starting to sweep the nation. I have an eBook on the subject of edible insects. It’s called ‘The Foodie Guide To Farming Insects For Protein.” Order your copy today. My eBook is available at Amazon.